Today we ventured to Bishan-Ang Mo Kio park, a wetland rich in biodiversity surrounding the Kalanng river, located in the midst of the city. Upon seeing the variety of birds, insects, and reptiles, I was surprised to learn that no biodiversity had initially been introduced to the park but that a vast amount of species attracted to the wetland have come to call the park their home. 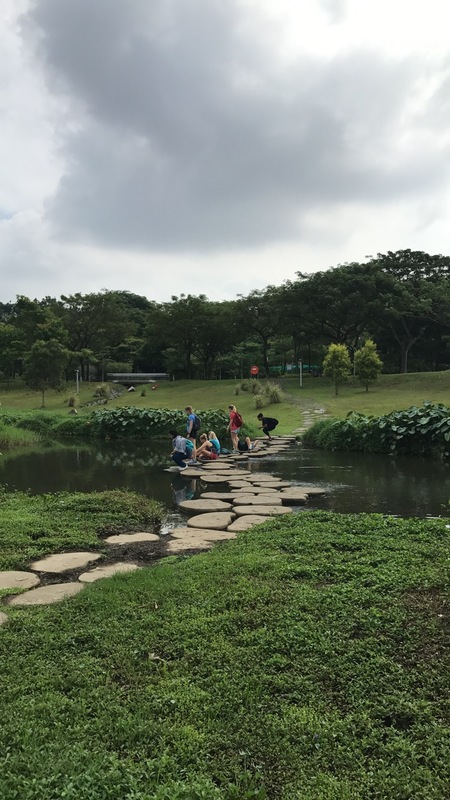 Dr. Dan and Tom explained that the park was a perfect example of the definition of Singapore: a place where native and invasive species live together and support each other in an urban tropical environment. Initially created to manage rainwater sustainability and foster a recreational environment, the park is a perfect example of how Singapore values maintaining and enhancing urban biodiversity while simultaneously providing recreational amenities. One can easily find playgrounds, waterparks, restaurants, yoga centers, and cycling and running trails intermixed with species ranging from the scaly breasted mania to the jacinth egg fly.The project which was initially set up under Active Beautiful Clean Water Programe by National Parks and the Public Utility Board to convert an existing canal into a natural river, uses water sensitive design approaches to help control rainwater sustainability. A combination of vegetation, rocks, and soil stabilizes the river bank and prevents erosion while also providing habitats for the organisms that live in the park. The vegetation along the river was selected to help cleanse and filter the water in an eco-friendly manner in the absence of harmful chemicals. We were able to identify organisms such as blood flower, ganged primrose, pagoda flower, spanish flag, little egret, common kingfisher, purple heron, white breasted water hen, painted jezbel and common sailor. We were all amazed and very excited to learn that a pack of critically endangered smooth coated otters even live in the park, and we were fortunate enough to be able to see one feasting on the koi that live in Kallang River. After our lunch of traditional Indian Basmati rice, we took the MRT over to The Urban Redevelopment Authority. The museum is an exquisite display of the architecture and ingenious engineering that has transformed Singapore from a wharf to the bustling and wealthy port city that it is today. 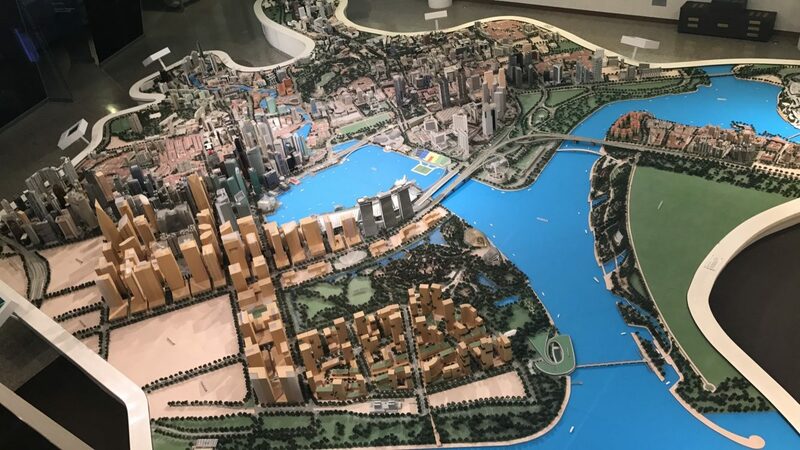 The gallery’s exhibits demonstrate how Singapore has transformed in the last 50 years and how it will continue to advance in the near future. Filled with scaled models of individual buildings and Singapore’s central area, the museum boasts about how Singapore has managed to maintain and beautify areas of nature immersed in biodiversity despite being a cosmopolitan city. It was no surprise to see the resorts, beaches, tree lined streets, old world charm, urban villages, striking skyscrapers, and parks represented in the huge city model. 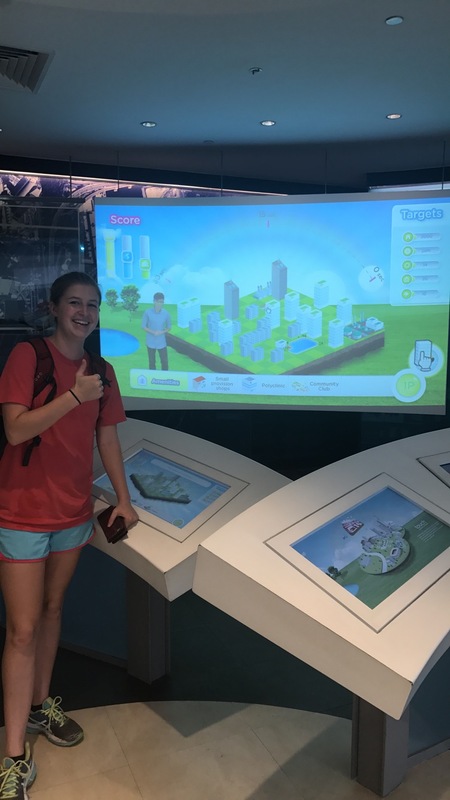 Maddy and I were able to use one of the museums interactive games to design our own city, which was much harder than we initially thought it would be. We quickly learned that one must think of adding various heights and designs for buildings, different types of living spaces to accommodate various incomes, parks and recreational areas, factories, farms, old and new villages, and heritage sites. It was interesting to learn that a leading reason for Singapore’s tree lined streets was to cool them and to provide a sense of place and identity. We learned that shophouse neighborhoods have strong history and there is an important effort made to maintain its heritage so that social and cultural memories are preserved . This provides an opportunity for the urban villages to reflect themselves in the evolving mix of culture in Singapore with historic areas for walking dining and shopping. Perhaps the most interesting thing that we learned at the museum was that Singapore recycles 57% and incinerate 41% of waste. This waste is later used to power 3% of Singapore’s needs. The “onward-looking” section of the museum showed models of buildings soon to be renovated or built, that take into consideration new growth, bridging communities, partnerships between private and public sector, conservation efforts, creativity and innovation.